This deluxe Chocolate Art gift collection will impress even the most discriminating chocolate lovers with the delicious confectionary creations tucked inside this vibrant abstract art gift tin. This gift set is filled with Max Brenner’s famous caramelized pecan Nuts with hazelnut praline & fine cocoa, Coconut Chokies, Dark Chocolate Marbles, CookiMax cocoa cookies, Espresso Chocolate Cubes, and Salted Caramel Chicao with caramel bits & sea salt. The uniquely designed re-usable tin is a gift that keeps on giving, long after the chocolate is devoured. This deluxe Chocolate Art gift collection will impress even the most discriminating chocolate lovers with the delicious confectionary creations tucked inside this vibrant abstract art gift tin. 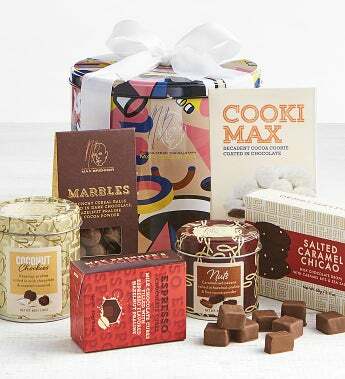 This gift set is filled with Max Brenner’s famous caramelized pecan Nuts with hazelnut praline & fine cocoa, Coconut Chokies, Dark Chocolate Marbles, CookiMax cocoa cookies, Espresso Chocolate Cubes, and Salted Caramel Chicao with caramel bits & sea salt.